Spicy Beans And Bangers anyone? Remember, Remember 5th November, Gunpowder, Treason and Spuds! Enjoy Hearty Recipe Ideas with Bannisters Yorkshire Family Farm. The smell of gunpowder hangs in the air, a roaring fire takes the edge off the chill, while excited people gaze in wonder at an ink black sky. It can only mean one thing; Bonfire Night and Autumn, with all that season, has to offer. Fancy making some Spicy Beans And Bangers? This November 5th enjoy a taste explosion of your very own with these spicy beans and bangers on a Bannisters potato. Heat the oil in a large pan, add the onion and fry until pale golden. Add the carrot, celery and pepper to the pan and fry until soft, stirring occasionally. Add the garlic and spices and stir for 30 seconds. Stir in the tomatoes, puree, drained chick peas and beans, with 100ml water, then bring the mixture to the boil. Cover and simmer for 20 mins. Meanwhile cook the chipolata sausages under a medium grill, turning until they are browned on all sides, cool slightly. Uncover the beans and simmer uncovered for the final 5 mins, until sauce has thickened. Serve the beans spooned into hot potatoes with the sausages alongside. For added spooky fun, cut the sausages to make fingers and put a flaked almond at the end of each to look like a witches’ fingernail. Stick these into each of the bean-filled potatoes. What do you think of this Spicy Beans And Bangers recipe? Spicy Beans And Bangers anyone? Remember, Remember 5th November, Gunpowder, Treason and Spuds! This is an amazing meal! 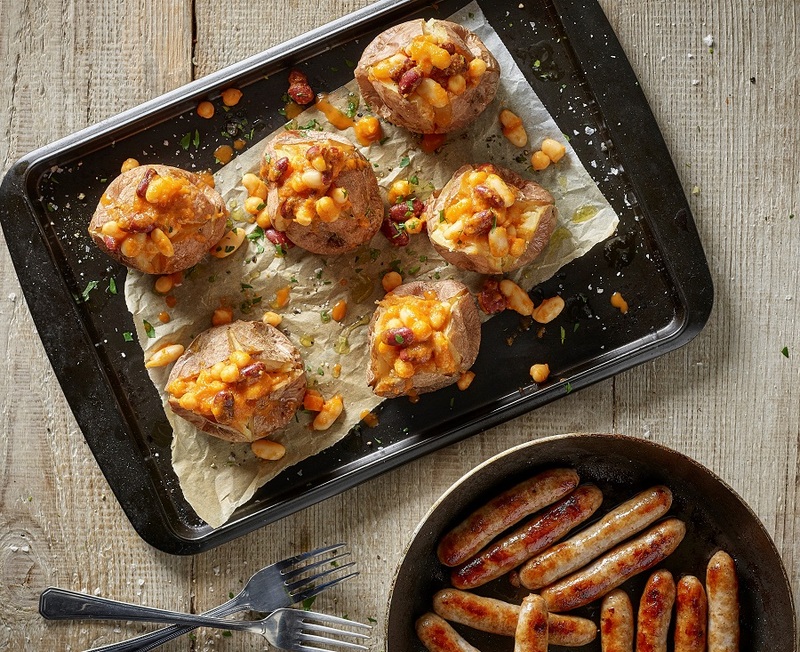 Beans, bangers, jacket potatoes -- what's not to love?! Looks scrummy! Looks like breakfast next weekend!! Thanks for sharing at the What's for Dinner party - hope to see you next week too. In the mean time, have a fabulous week ahead! It is very cold and rainy here today and this meal would be wonderful! Thanks so much for sharing with Full Plate Thursday and have a great week!